Ian bikes down John Street regularly. He recently captured the chaos that is John because of the road space given over to patios and muskoka chairs. 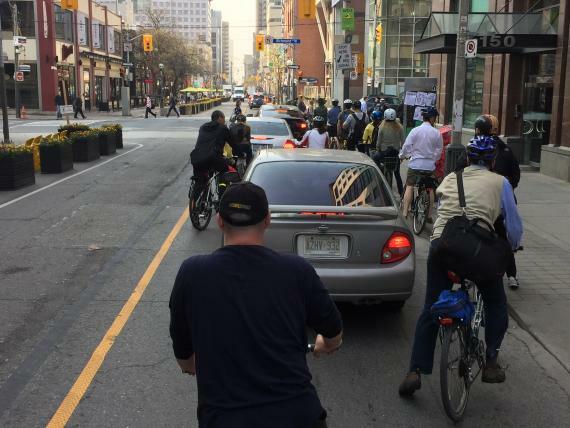 John Street has become uncomfortable and less safe for cyclists. But instead of fighting against improvements for pedestrians, we need to focus on how we can reduce the motorized traffic by making it harder for cars to use John as a direct route. My attempt at capturing the mess. Some people misunderstand the issue here. The issue at heart is not about making John Street more pedestrian-friendly. Myself and others who have a problem with the City's actions thus far is not to try to preserve the car-centric John Street of yore. Nor do I believe that the City has rid itself of any responsibility to cyclists on John by moving the traffic light on Queen at Soho/Peter. It was the absolute minimum that the City could have done but still not enough to entice most cyclists from taking John. The problem at heart is that the City is being half-assed about John Street. There is NO plan to reduce car traffic on John Street. So the pilot project has installed some planters to create a hard barrier between people sitting in chairs and the cars and cyclists. For the short term this has created a squeeze of cars and cyclists who are now forced to fill in the little gaps left by the cars and trucks. There was no effort to try to divert cars and trucks away from John so the traffic is as heavy as ever. It's torture for cyclists and hardly friendly to pedestrians. But even the final design which City staff are working on right now has no plans to deal with car traffic. With all the talk about "cultural corridor" and "pedestrian priority route" there is nothing about diverting car traffic. Instead it talks about fuzzy things like gently sloping curbs, new paving materials and new trees. But for anyone who ever visits Kensington Market you'll know that this is hardly enough to create a "pedestrian priority route" even though Kensington has a much greater pedestrian traffic than John. Kensington is as choked as ever with cars and trucks. So instead I'm on the same page as Jared Kolb of Cycle Toronto who is calling for the City to create true Bicycle Boulevards and not the half-assed cycling routes. A key feature of bicycle boulevards that's relevant here is motorized traffic diversion. An example of a traffic diversion with cycling bypass on Health St E and Inglewood Dr in Toronto. Bicycle boulevards discourage cut-through motor-vehicle traffic but allow local motor-vehicle traffic. They are designed to give priority to bicyclists as through-going traffic. They are intended to improve bicyclist comfort and/or safety. On a "cultural corridor" and "pedestrian priority route" like John Street, wouldn't it be in the interests of people—whether they are pedestrians, merchants or cyclists—to discourage cut-through motorized traffic? I believe we can all win if the City just woke up to this option. Agree completely with your assessment that this is a half-baked scheme that could be much better. Perhaps having car traffic in one direction, with bike traffic in both directions (ideally in separated tracks) would be the way to go? I totally agree that "bike boulevards" otherwise known as "traffic calming measures" is critical on a designated bike route shared by cars. Otherwise you get a lot of drivers avoiding main arterial traffic and short cutting down the bike route. Definitely more bike boulevards are needed. After 20 blocks the effect of one bike boulevard has diminished and another one should be. access Adelaide. There’s no bike track connection from Beverley to Simcoe Street. Hence the significant use of John Street by bikes, that will only dramatically increase. "From your FAQ: “dedicated bike lanes (Alternative 5) preclude the expansion of the pedestrian realm north of Adelaide Street West” That would only be true if two car lanes are kept. 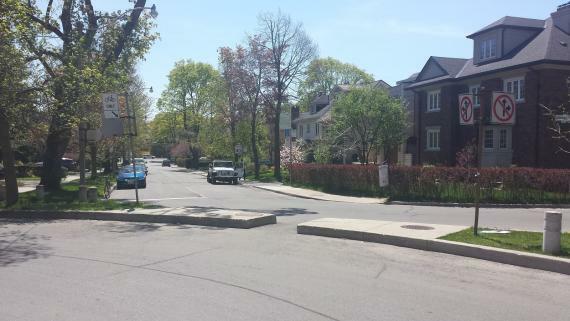 "And this: “Assessment for this scenario is currently underway to explore whether a one-way street is feasible from a transportation perspective and appropriate given the objective of making John Street a destination.” What are the results of that assessment? Bike tracks are vastly friendlier to “a destination” that car lanes. Queen’s Quay Revitalization is such a great example of that compatibility. "I see that there seems to be a City policy that says you can’t have two way bike lanes on a one way street. Where did that come from? Certainly Simcoe belies that. "Potential for conflict with cars is huge, as I experience regularly. "The real solution is to make John one lane one way for cars, and ensure bikes are given dedicated tracks. "I do note, too that only a modest Schedule A+ EA is required for bike lane installation: Not a big deal, and nothing that should delay this project." I was in touch with Joe Cressy's office regarding this. I was told that he will be holding a meeting with Transportation Services and the BIA soon to explore ways to reduce through traffic on John. It would not hurt to follow up with him and find out what the status is. This would be great if the motor traffic could be reduced on John Street. No offence to anyone who drives or anything, it's just a fact that a lot of motor traffic in any area makes it less attractive to anything else. You can drive pretty well everywhere else in Toronto, having a tiny handful of traffic calmed streets won't make driving any worse. I was in Toronto last summer cycling down a neighbourhood greenway (I forget the name now) but was surprised how much motor traffic there was. There were no traffic diverters like there are on similar streets in Vancouver. I had people driving aggressively behind me impatiently honking. There was no shoulder to go to since the street was narrowed to make it into a neighbourhood greenway. Crazy. It was worse than just a regular street. They should either ban all motor traffic on it (except deliveries and locals) or make it one-way. Two-way for cycling. This would make the pedestrian area nicer. Motorists will at first grumble but will quickly adjust and then get over it. A Toronto man pleaded guilty Thursday morning to the 2012 hit-and-run death of cyclist and school teacher Tom Samson. After Samson was killed in a hit-and-run in November 2012 near Davenport Rd. and Lansdowne Ave., police charged a minivan driver with failing to remain at the scene of an accident causing death. Thursday morning Miguel Oliveira pleaded guilty to that charge in a brief court appearance as Samson’s family tearfully looked on. The agreed statement of facts will be read in court during a sentencing hearing scheduled for August. Samson’s family has previously criticized the investigation into his death, hiring criminal lawyer Edward Sapiano to look into the case. While police initially told Samson’s wife he rode a bicycle through a red light and was heading northbound, it was found later that Samson was stationary, or near-stationary and waiting to turn left when he was hit from behind, Torstar reported in 2013. Sapiano wrote a letter to police and Crown urging them to re-open the case. Samson, a 35-year-old father of two and a Grade 2 teacher at Swansea Public School, was killed on his way to meet friends for breakfast before work. 1) Take the lane. Riding in the centre of the lane making motorists physically impossible to pass you without changing into the opposite lane. There may be some yelling inside the cars - but they will get over it quickly - and most importantly they will see you and won't squish you between the their fender and those lovely planter pots. 2) If the light is red do not pass those cars that intend to go straight. You are just unnecessarily stressing yourself out. Let them accelerate and get out of your way. They have 100+ horsepower engines and unless you are Arnold you have less then one. I like to start at the lights after the first turning vehicle - so its easier to merge and if there are pedestrians you have some breathing space till traffic catches up. 3) If you are headed southbound towards Adelaide use Nelson instead of John. I find John/Adelaide intersection to be dangerous - for many reasons. You can make wonderful progress using Nelson to Simcoe - and then making a left on Adelaide. 4) This goes without saying - but don't run red lights! Nothing undermines Cycling Advocacy more than the perception of cyclists as morons who are unable to follow the rules. Other road users expect you to stop - stop. I've been recently learning just how bad this intersection can be. On John going north, there is no option other than to take the lane. I was biking through after a blue jays game and tons of pedestrians everywhere. Car honked at me non stop for taking the lane in front of him, even though we were just slowly moving from red light to red light. Southbound at Peter, the bike connection there is ridiculous. The sensor doesn't always register a bike, the green light is very short, and it's a tricky jog across the streetcar tracks. I love the cycle tracks on Richmond and Adelaide, but east of university there is just simply no good way to get south to them. If protected Cycle Tracks were built on University Ave. (i.e. College to Adelaide) would you still need to use John? If a faster route on University was available I would not even be on John. Just wonder if this would work for you.